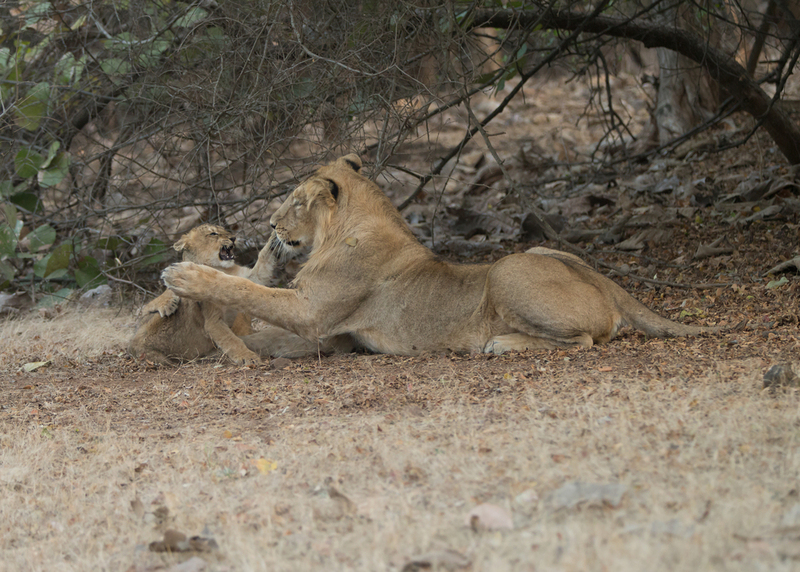 Asiatic Lion cubs, Gir Forest NP, January 2015. A SHORT FLIGHT ACROSS THE GULF OF CAMBAY took us from smoggy Mumbai to Rajkot on Gujarat’s Kathiawar Peninsular where we began our latest Indian adventure, as usual, with the first of many spicy masala omelettes and masala chai (India’s popular ginger and cinnamon-spiced milky tea), in a rather grand local hotel. Soon we were on our way south to Sasan Gir, our base for the next two nights. The forests of Gir hold the last remaining population of Asiatic Lions, a subspecies of lion whose range once extended from Central India as far west as Macedonia. Whilst very similar to its African relatives Asiatic Lions have a distinctive longitudinal fold of skin along their belly, generally thinner faces and the males have a shorter and more blackish mane. The lions of Gir are also renowned for their approachability, which usually makes them good photographic subjects. Fortunately Gujarat is now back to a more normal water supply situation following the failure of the 2012 monsoon taking pressure off the dry deciduous teak forest. However, the lions were not as co-operative as usual but thanks to our very helpful local contacts, we still managed a very good encounter with a pride of nine of these impressive cats. Terrific stuff! Birds are always a feature of our jeep safaris at Gir and we had a few good photo subjects, including Crested Serpent and Hawk Eagles, Indian Thick-knee, Yellow-wattled Lapwing and a fantastic battle to the death between a Common Woodshrike and a mantis. The latter put up a good fight but eventually succumbed. Other mammals at Gir included many Spotted Deer (or ‘Chital’) as well as a few Nilgai (or ‘Blue Bull’ – the massive Indian antelope) and Sambar deer.